I was not about to spend another $300-$400 on another under cabinet microwave. That's just ridiculous! I don't understand why we've been through two already. We use ours daily, just like everybody else, right? So, we decided to build a shelf instead, to hold a regular cheaper microwave. 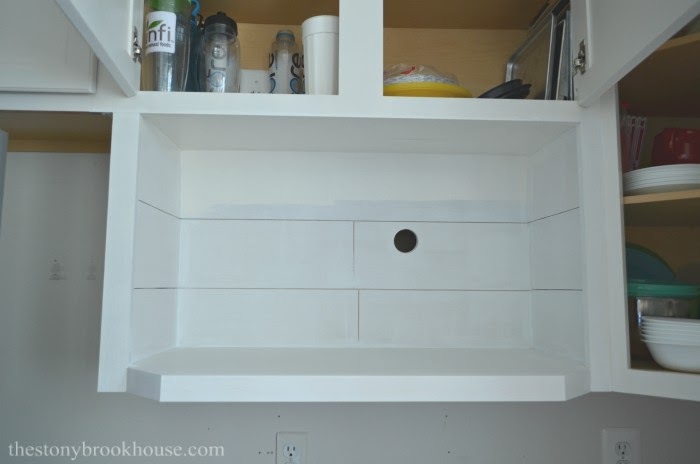 This isn't a tutorial on how to build one, because everyone's cabinets are different. 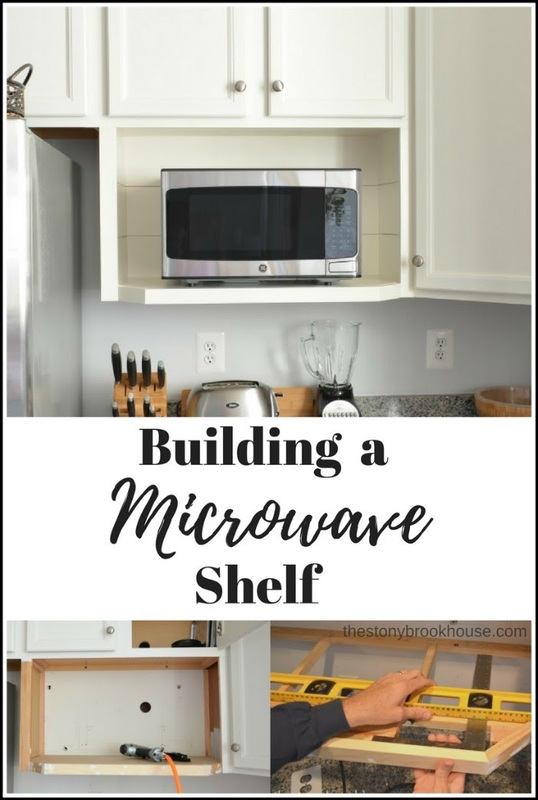 This is more explaining what we did to create this Microwave Shelf. After tons of searching, I finally purchased a new one. 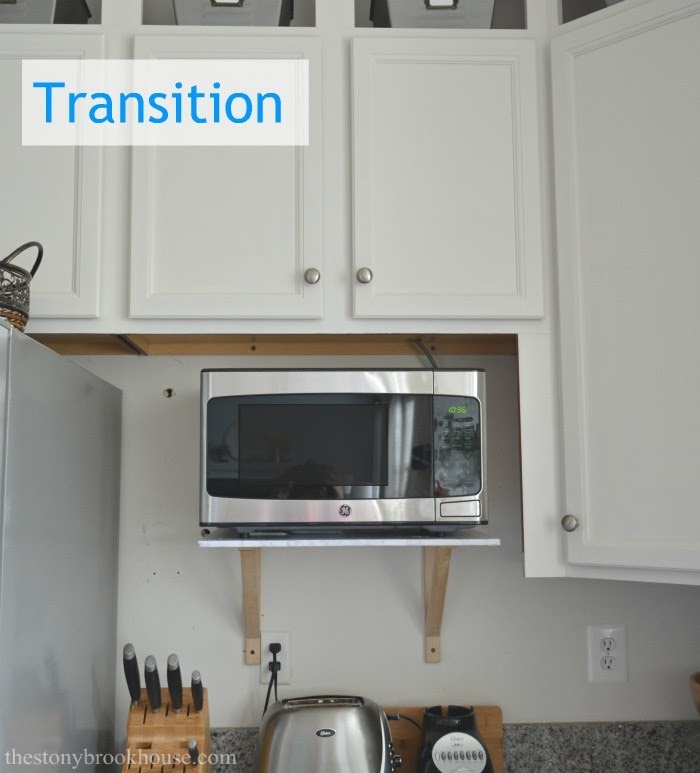 I was so tired of having a microwave on the counter, that I put up a temporary shelf with brackets and a piece of plywood covered with contact paper. So glad I did, because we were super busy for a couple of weeks. There just wasn't time to build it properly. 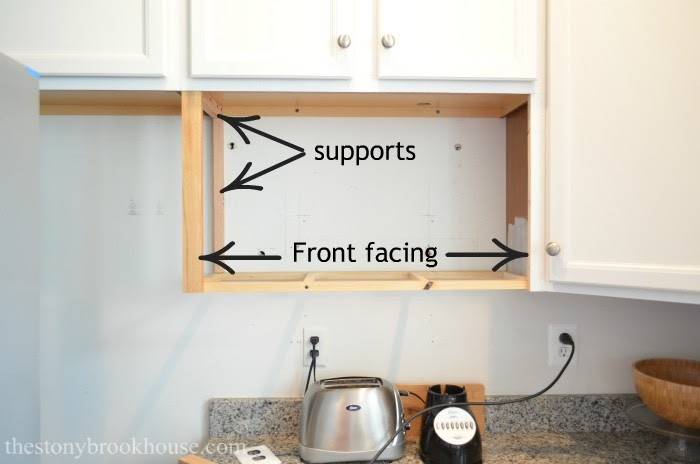 Basically, we needed to figure out how to support the shelf from underneath the cabinet. 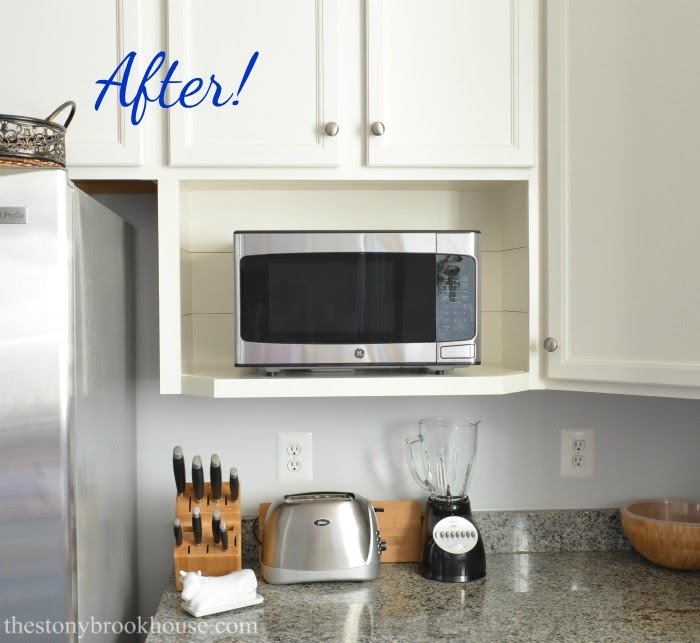 Microwaves aren't all that heavy, but we wanted to make sure it wouldn't budge! Then adding the front facing so that it looked "built in". The width and height of the shelf was pretty easy to figure. We were just going to make the shelf fit the space. The depth was the tricky part. Under cabinet microwaves usually are the depth of the cabinet. Regular microwaves vary a great deal in the depth department. We chose one that we felt was a happy medium. 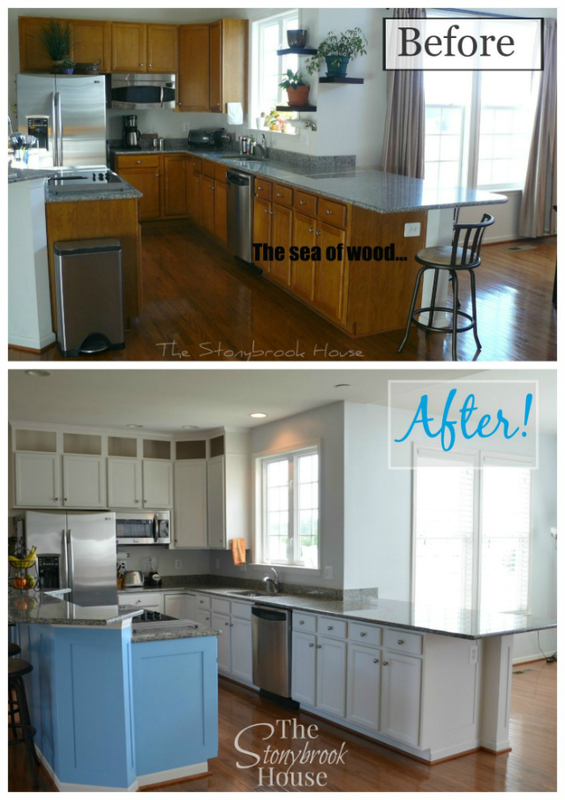 It was definitely going to stick out past the cabinets, but I think Hubby did a great job making it blend in. 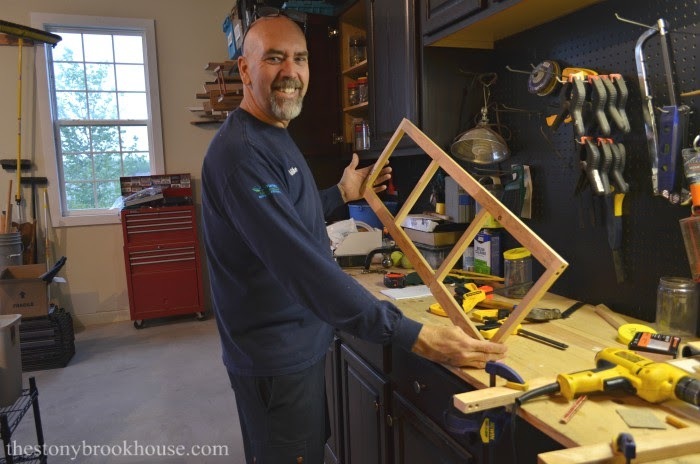 So, here we have made a frame base and started adding supports to the underside of the upper cabinet. 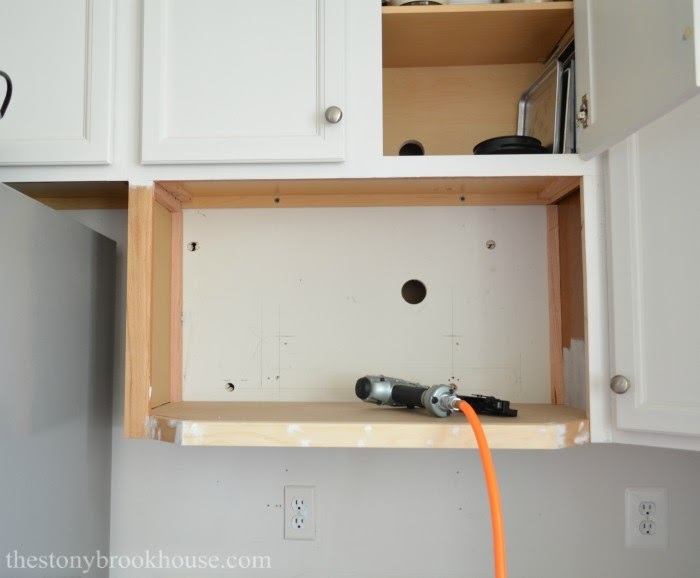 We added the support on the left from the front to the back, attaching it underneath the upper cabinet. Then we screwed in the hanging supports to the upper support on the left side to hold the shelf in place. Next, we secured the frame to those supports. Lastly, adding the front facing to each side. We used scrap wood for most of the supports and used nice 1x2s for the front facing. There is a gap behind the front facing board to allow for the MDF on the side, so it will be flush with the front facing board. 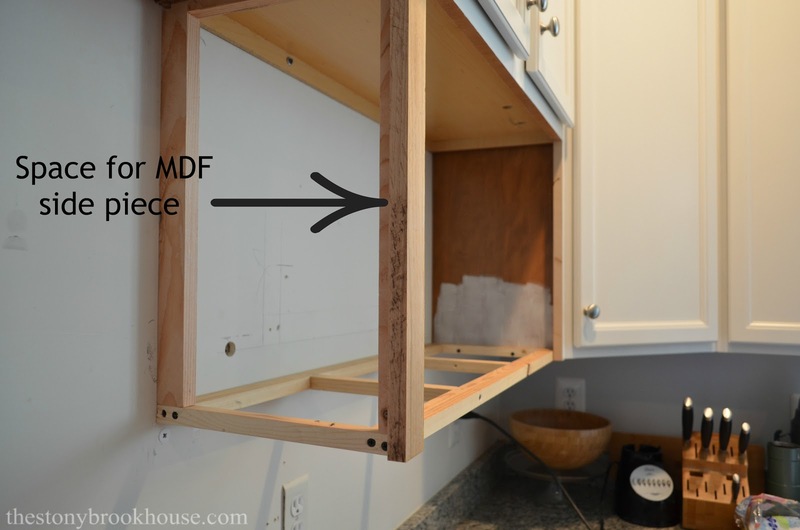 We will also use MDF for the base of the shelf. 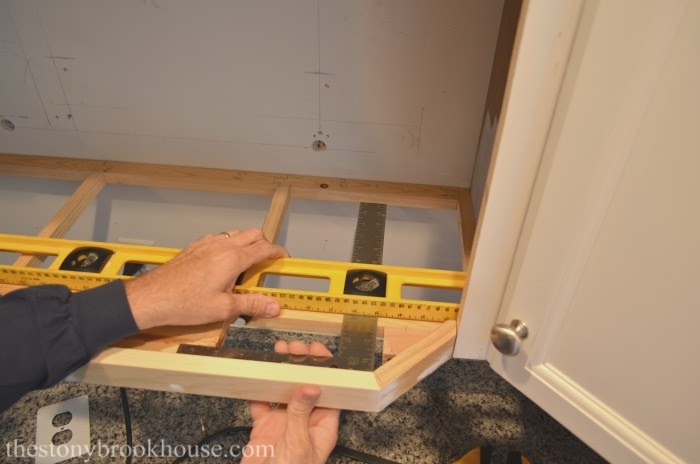 Hubby extended the base frame to allow for the extra depth of the new microwave angling the edges to meet at the cabinets. The angles were tricky, but he did it!! Here he is measuring for the MDF base board. He wants it to fit right into the space and be flush with the front facing. 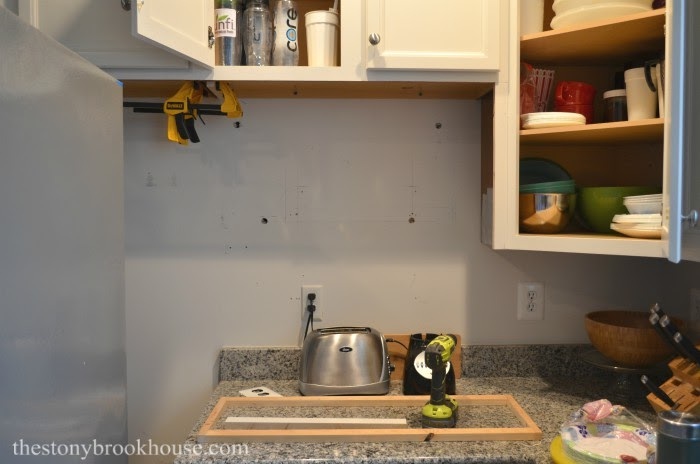 Our solution was to 'shiplap' the interior of the shelf. It's pretty easy. We just had to add supports for the shiplap to be nailed to and got it done! You can see that Hubs already drilled the hole for the cord. 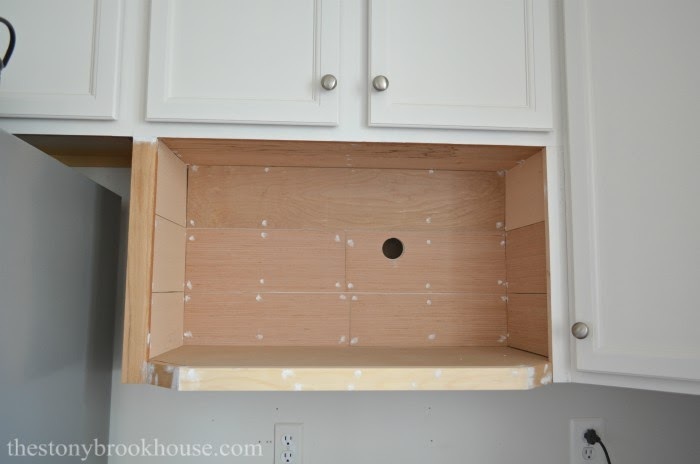 We will feed it up through the wall and out the hole you can see in the upper cabinet. There is an outlet in the left side. Well, now look at that! Not bad, right?? I'm not to worried about the center lines, they will be covered by the microwave. It really turned out better than I thought. Yay!! Time to sand, caulk and prime! Two coats of my favorite primer in the world!! Zinnser Bullseye 1-2-3 Primer. You can see that I already started to paint... That's when I remembered I hadn't taken any photos!😮 Two coats of paint and we can call this project finished!! OMG! It looks terrific! Doesn't it look like it's been there all along?? Sooooo happy! Hubby and I are a great team! Way to go!! 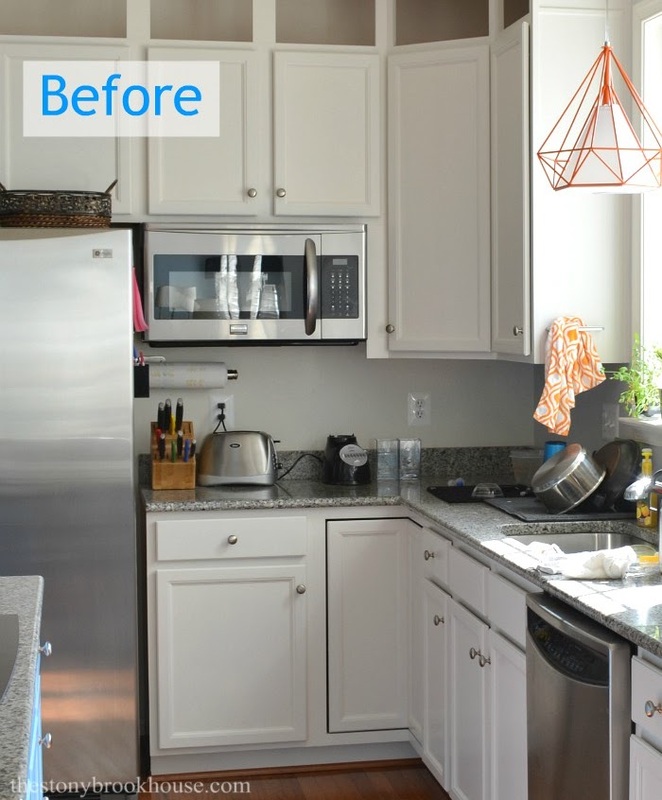 You integrated so nicely to your pretty kitchen and it looks way better than the bulky under the cabinet microwave you had before. 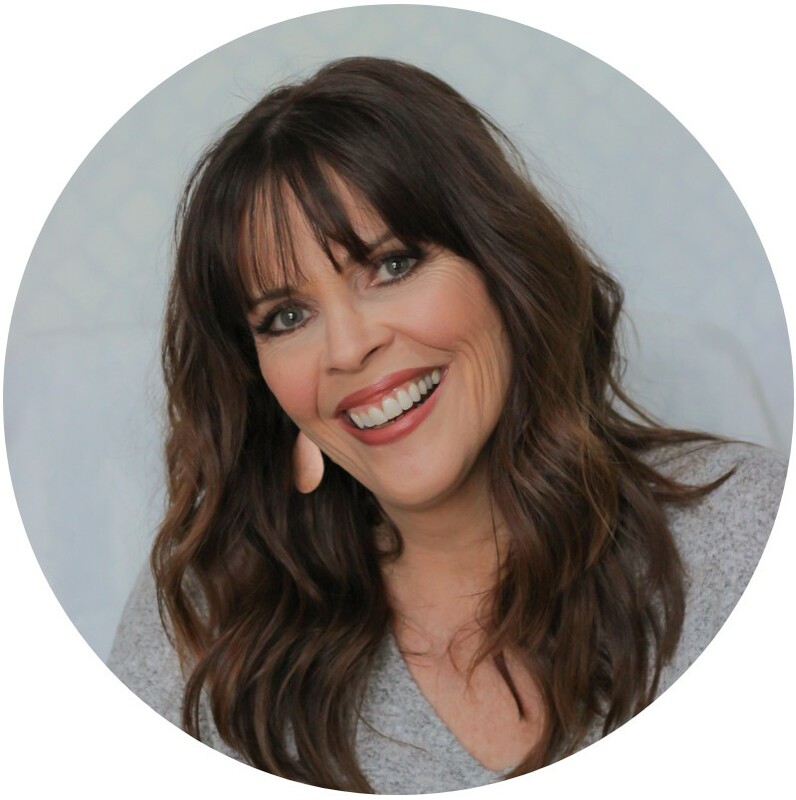 I LOVE the shiplap treatment on the back, so pretty!